The Kozak sequence is shown to be important in translation initiation, and the A-site is the anti-codon recognition site. If the distance is not known, how could I find out what it is? 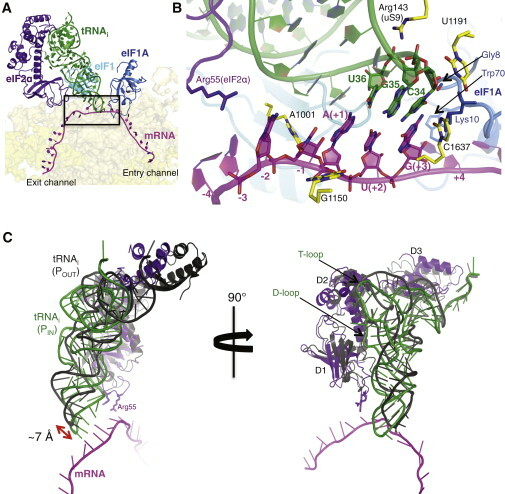 Is the crystal structure of the whole mRNA-rRNA-tRNA complex determined? If so, what modeling program would be best for establishing intermolecular distances? Kozak consensus sequence (KCS) is present near or overlapping with the start codon. I am not sure what you mean by distance between that and A-site. Start codon is localaized at P-site at the time of translation initiation. Distance between start codon/KCS and A-site at initiation is same as distance between P- and A- sites (I guess ~20Å). A-site keeps moving during translation and hence the distance keeps increasing. Crystal study is available; See here. See this figure from the abovementioned study for the relative positions of start-codon, P-site (exit) and A-site (entry). Not the answer you're looking for? Browse other questions tagged structural-biology ribosome or ask your own question.